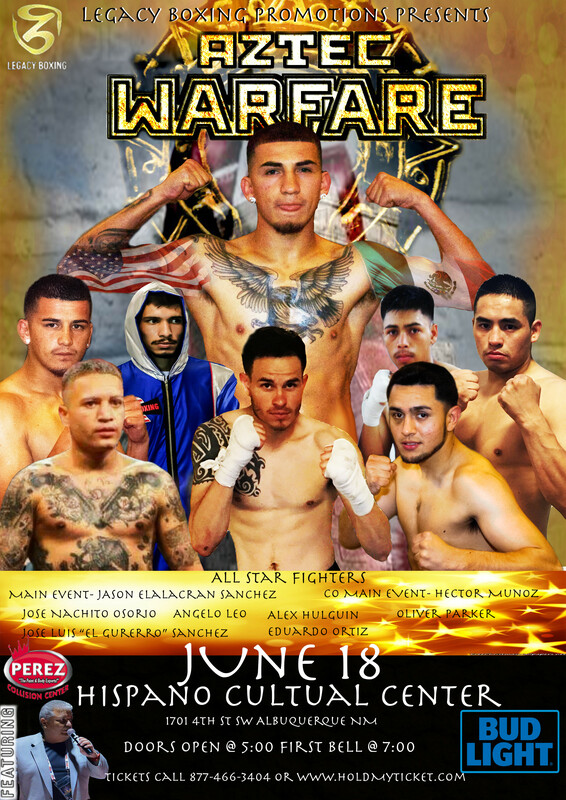 Legacy Promotions has moved Aztec Warfare back a week to June 18th still at the Hispanic culture Center with Jason Sanchez against Raymond Chacon as the main event. Jason Sanchez has 3 win by technical knockout, including his most recent pair of wins over Damen Wood and John Herrera. Chacon a vet of 24 pro fights has dropped back decisions to Jose Haro and Joshua Greer Jr., but in his last trip to the 505, Chacon scored a split decision win over Tony Valdez. 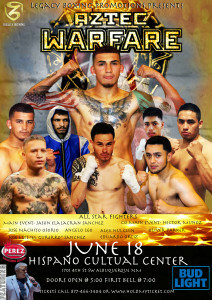 The co-main event will see 50 fight vet Hector “El Hurracan” Munoz facing Harlingen, Texas’s, Hector Garza, who’s a 20 fight vet. The card will also see undefeated Angelo Leo who’s won 5 of his last 6 via knock out against Joshua Greer Jr., who’s won 5 straight decisions. Alex Holguin will be bringing a 6 fight win streak into his bout with Martin Solis, who’s coming off a TKO of Joe Trevino.